Winner of the Stay-Dry Nursing Pads 3-pack is....Melissa! 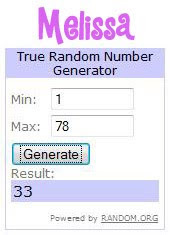 Congratulations Melissa of http://korbengrey.blogspot.com/ Her comment, 33 was chosen by random.org as the winner of the Stay Dry Nursing Pads 3-pack! Head on over to her Blog and congratulate her! Thank you to everyone who participated and made this another successful giveaway! Be sure to check back in on Monday and see the details of our next giveaway! Lucky girl! I don't know where I'd be without my Knickernappies nursing pads! I don't leave home without them!!! I am so excited to have won! Thank you so much!!! !